The Jedi lightsaber is the weapon of elegance of a more civilized time. In the hands of a Master, a Jedi lightsaber is unstoppable. It slashes through blast doors or whatever type of enemies. Using the Force, a Jedi can predict and deflect incoming blaster rays, and fire them back at the opponent. 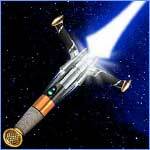 When deactivated, a Jedi lightsaber appears as a metallic handle, lined with control buttons and lights. Upon activation, the energy contained within is fully released and generates as a shaft of pure energy about one meter long with various colors ranging from red, blue, green and purple. Humming a distinct sound, the lightsaber’s shimmering blade is capable of slashing through anything except for another lightsaber’s blade. Lightsabers have changed little in the thousands of years of their employ by the Jedi Order. It was believed that the Jedi order began on the ancient world of Ossus point, where there was an abundance of Adegan crystals in the system. These crystals are essential for the creation of a Jedi lightsaber. Adegan crystals (also known as lightsaber crystals) focus the energy released from a lighsaber's power cell into the tight laser beam. In todays modern world where vast advancement in science and techology and the manipulation of laser light for several industrial application, one cant help but wonder if the possibility of creating real light-sabers for weaponry is inevitable. 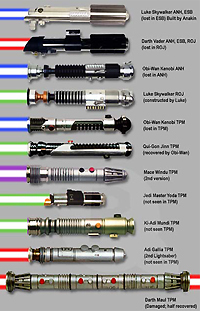 In the original film trilogy, Jedi lightsaber blades were blue, green, and red. Obi-Wan Kenobi remembered that more civilized time, before his colleagues fell and darkness enveloped the galaxy. The great Jedi met his own destiny wielding this lightsaber against his former pupil, Darth Vader. Unlike most martial arts involving a weapon, lightsaber duel is an art that is utilized before the weapon is ever drawn and ignited. This is due to the philosophy that a Jedi must only draw his weapon as a final recourse. 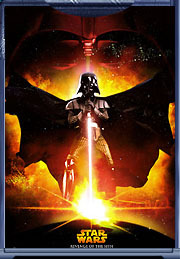 A Jedi must decide on what situations require the application of deadly force, since the lightsaber is one of the deadliest weapons ever constructed.